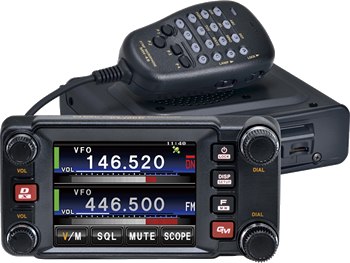 With the YAESU DR-1 repeater, digital communication and conventional FM communication can join together in a single multiple function system. Digital GM Function (Digital Group Monitor Function) The digital GM function automatically checks whether members registered to a group are within communication range, and displays information such as the distance and orientation for each call sign on the screen. This useful function not only enables you to see which friends are within communication range, it also enables you to see at a glance where all group members are located. Conventional FM has a number of excellent features that continue to provide substantial advantages over digital modulations, such as low battery consumption. Communications on the VHF and UHF bands will continue to be the mainstream communication method for Ham Radio in the future. Digital modulation provides a wide range of advantages by enabling the exchange of more complex information, resistance to radio interference and better audio quality. MY Radio was Purchased from Lee at LAM Communications. You can discover a completely new side to amateur radio that was never before possible with conventional FM systems. By using the revolutionary System Fusion, the user no longer needs to choose between digital or conventional FM; instead, we can use whichever system is best suited for the situation. Users can also communicate freely between digital and conventional FM stations. Compared to other digital modulations within FDMA, C4FM has excellent communication quality .Presently, C4FM is the standard method for professional communication devices in FDMA, and is therefore expected to continue to be the main stream digital communication in the future. Until now, FM repeaters were only used for conventional FM communication, and digital repeaters were only used for digital communication. There has been no option for cross-communication in a single repeater. However, System Fusion can be used in multiple ways, for digital communication, for conventional FM communication and even internet communication. Most importantly, System Fusion enables intercommunication between all users. This is enabled by the AMS (Automatic Mode Select) function used in System Fusion. With AMS, the modulation of your station is automatically selected according to the received signal. If a member transmits in conventional FM, the other radios in the System Fusion automatically select their modulation to conventional FM to communicate between all members. V/D mode (Voice/Data simultaneous communication mode) The digital voice signal is transmitted in one half of the bandwidth. Simultaneously the other half of the 12.5 kHz bandwidth channel is used for error correction of the voice signal and other data. By incorporating powerful error correction technology developed for professional communication devices, effective error correction codes provide the advantage of fewer interruptions to conversations. The standard C4FM FDMA Digital mode provides the ideal balance of error correction and sound quality with the Digital Clear Voice technology developed for C4FM digital. Voice FR mode (Voice Full Rate Mode) This mode uses the full 12.5 kHz bandwidth to transmit digital voice data. The increased amount of voice data permits high quality voice communication, providing superb sound quality for a “rag chew” with friends. High-speed data communication mode uses the full 12.5 kHz bandwidth for data communication. The transceiver automatically switches to Data FR mode when transmitting Snapshot pictures, and can be used to transmit large quantities of data at high speed. FM mode Analog FM is effective when weak signal strength causes audio drop out in the digital mode, and enables communication up to the borderline of the noise level. Also the use of established Yaesu low power circuit designs provides far less battery consumption than the digital mode. In System Fusion, you can choose between three C4FM digital modes and a conventional FM mode to suit your needs. The Automatic Mode Select function detects the receive signal mode By simply replacing the current conventional FM repeater station with the DR-1 System Fusion digital repeater, you can continue to use the conventional FM communication, as well as using the repeater for digital communications. Because the DR-1 is capable of converting and transmitting digital communication to conventional FM communication, you can intercommunicate with members using either conventional FM communication, or those using C4FM digital communication. Previously, when a repeater group planned to use a digital system, all other members of the club using conventional FM communication needed to purchase equipment capable of digital communication. On some some radio's this function can also be used to send data such as messages and images between group members. Snapshot Function (Image Data Transmission) Simply connect an MH-85A11U (option) microphone with camera and press the microphone shutter button to take snapshots easily and send them to other C4FM FDMA digital transceivers. Real-time navigation function enables location checking at any time In digital V/D mode, information such as position data is transmitted together with voice signals so the distance and direction to the other stations can be displayed in real-time while communicating with them. Backtrack function that starts navigation facing a registered point this enables navigation to a registered location at the touch of a button. When hiking or camping, simply register your starting point or campsite before departure, and the distance and orientation from the current location is displayed on the screen. This function instantly recognizes whether the received signal is C4FM digital or conventional FM. The communication mode automatically switches to match the received mode. Even if a digital signal is being used, you can switch to FM communication if radio signals are received from a FM station. This function enables stress-free operation by removing the need to manually switch the communication method each time. System Fusion is not compatible with D-STAR GMSK format . 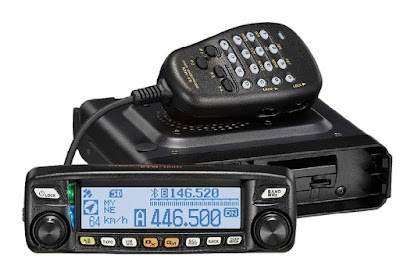 Only when using C4FM digital direct communication (simplex) System Fusion joins digital and conventional FM communication into a single multiple function system.With the introduction of the new FTM-100 which also follows the lead with it's older brother the FTM-400 by having the capability of receiving GPS satellite information . Now any radio's that have that same system know how far away from each other they are and will display that information , should you require it to be shown or sent .